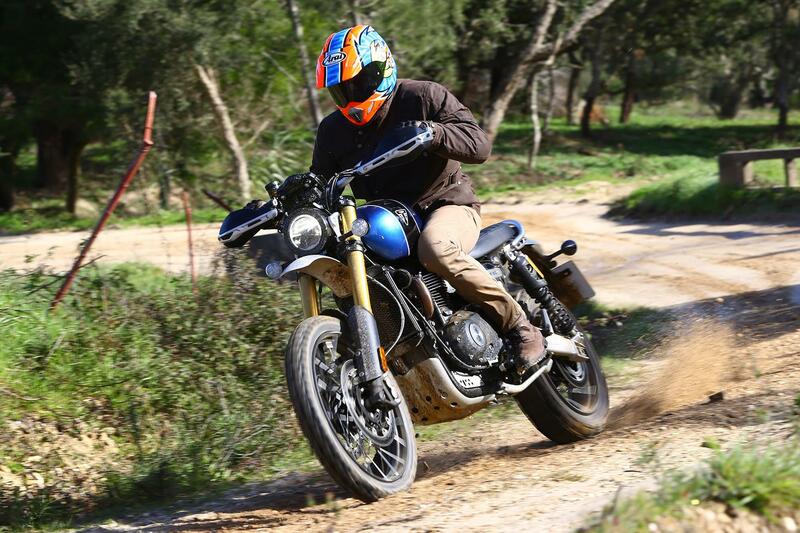 Based on looks, equipment, technology and value for money alone, the new Triumph Scrambler 1200 is worthy of a space in your garage. But it isn’t just another 60s-inspired retro; it’s so much more than that. On the road it can be calm, refined and give you the thrill of a sportsbike, but its ability to be a scrambler in more than just name is impressive. 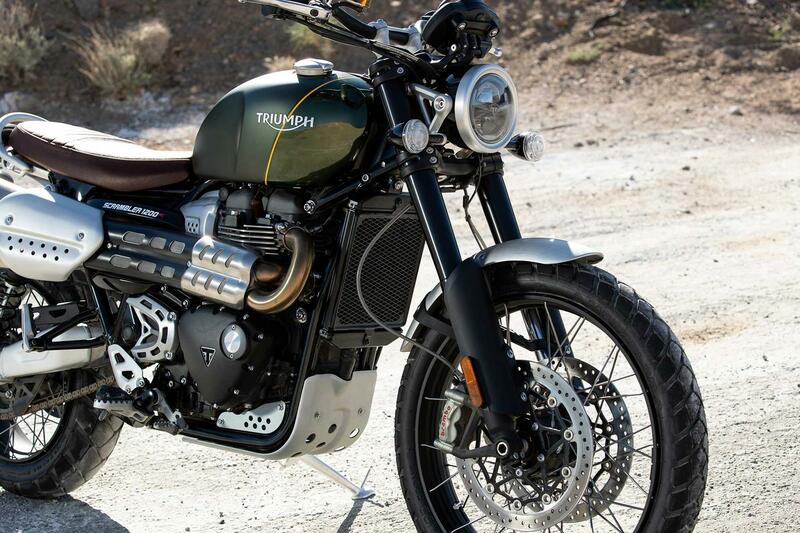 A serious off-road tool, the Triumph is an adventure bike that just happens to look like a retro. 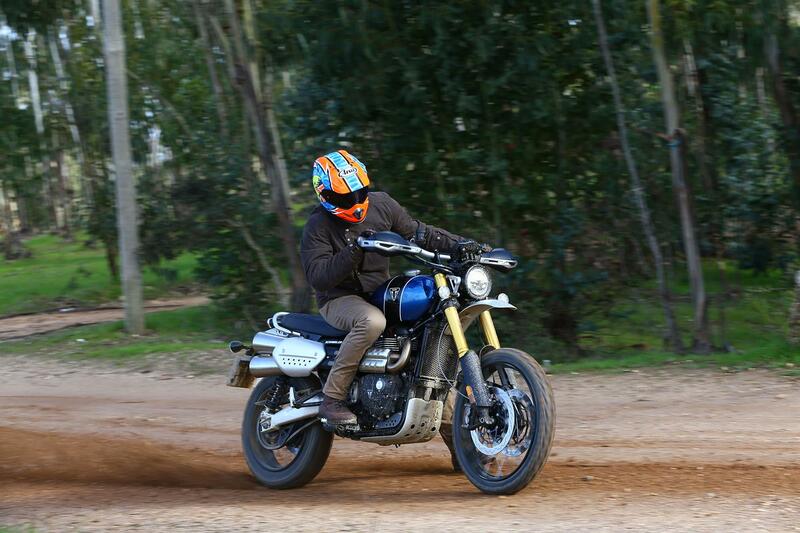 There’s no question the Scrambler 1200 will look cool lounging outside a café, but it has the minerals to be ridden hard, especially on the loose and more than lives up to its scrambling name. 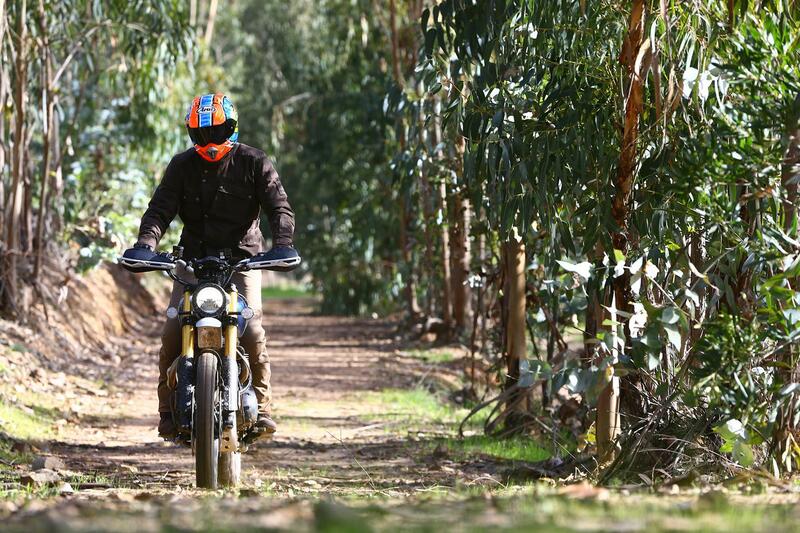 The Scrambler 1200 XC will happily cruise, scratch and get mud in its turn-ups, but with its beefier, longer travel suspension, stretched wheelbase, wider bars and more sophisticated electronics, the Scrambler 1200 XE is blessed with an extra layer of off-road ability and is capable enough to rival all but the most serious of adventure bikes. 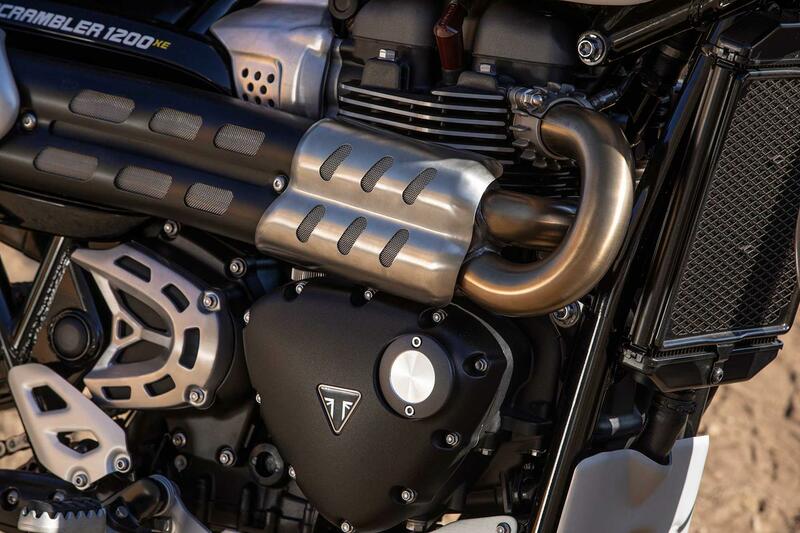 These major chassis mods tell you everything you need to know how serious Triumph are about the Scrambler’s off-road pretentions. 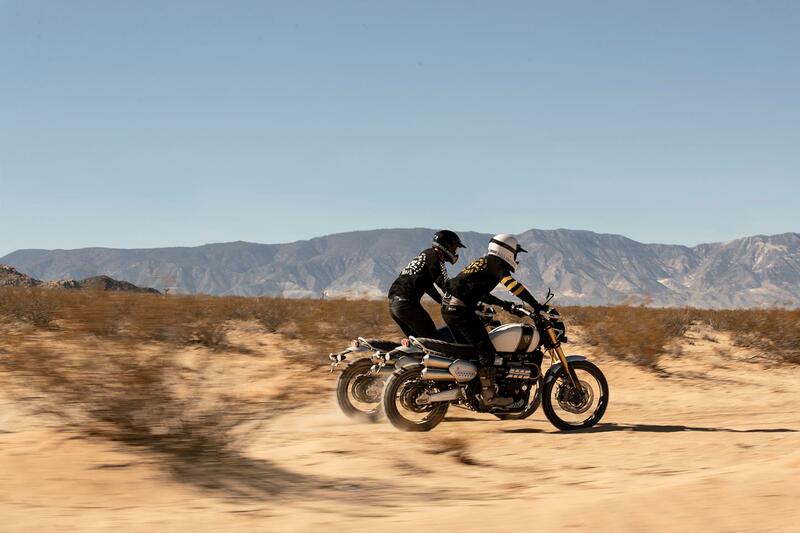 It glides over bumps, digs into corners, wheelies off crests and generally flatters you, feeling less like a retro and more like an adventure bike with all its plastics ripped off - nimbler and less clumsy, but oh so capable. 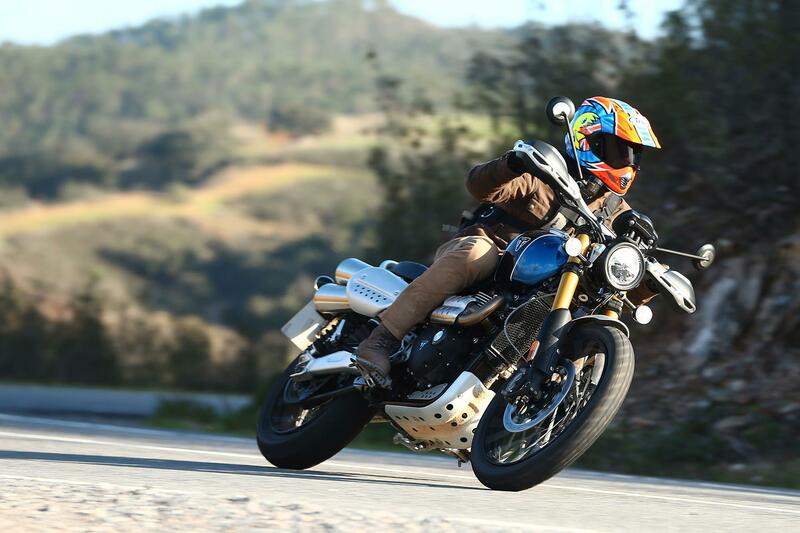 Poke the Triumph with a stick on the road and it turns from mild-mannered mud-plugger, back into the fast 'n' smooth, fine-handling Thruxton it’s based on. 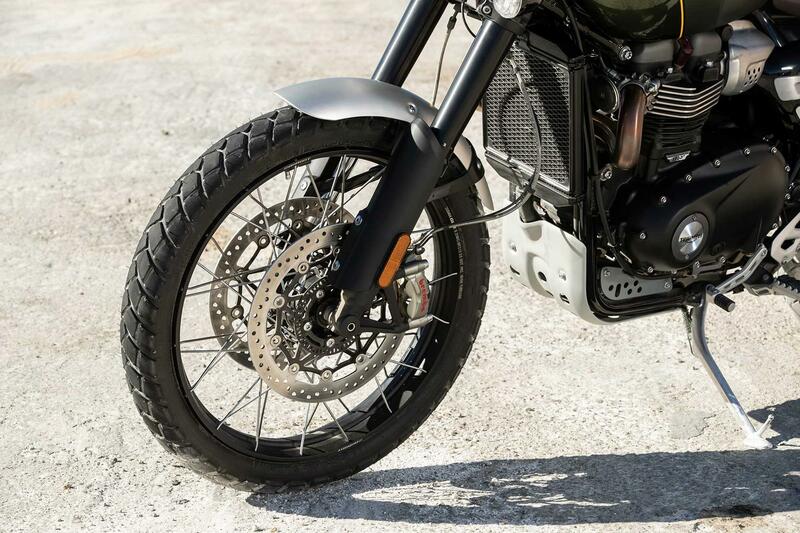 It may have a penny farthing-sized front wheel and long travel suspension, but the Triumph doesn’t flop around beneath you like a lumbering, lazy enduro. 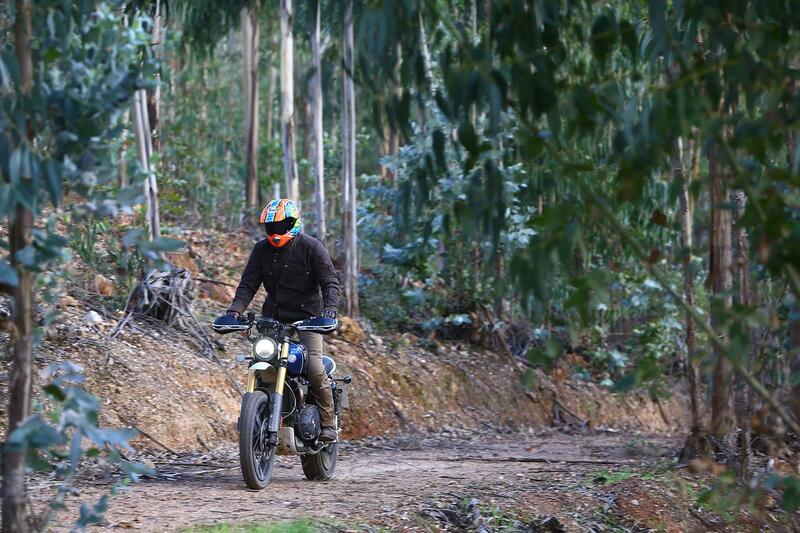 The ride is taught, controlled and when you hit bumps and potholes you’re glad of the leggy Öhlins and Showas. The XC is slightly tighter and quicker steering, but the XE has more refined rider aids. 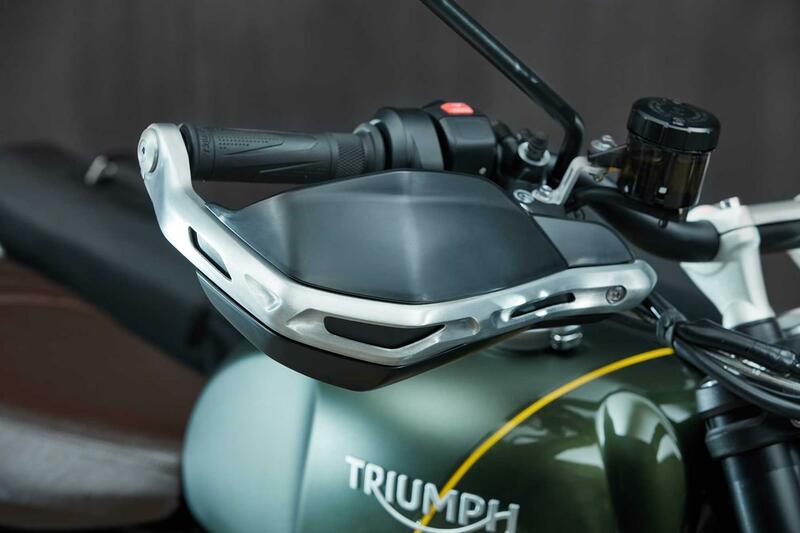 ‘Off-Road Pro’ mode may disable the riding aids for the dirt, but on the tarmac in Rain, Road, Sport and mix ‘n match Rider modes, you can lean on electronics, but such is the poise of the Triumph’s chassis and grip of the Metzelers the silicone safety net is barely troubled. 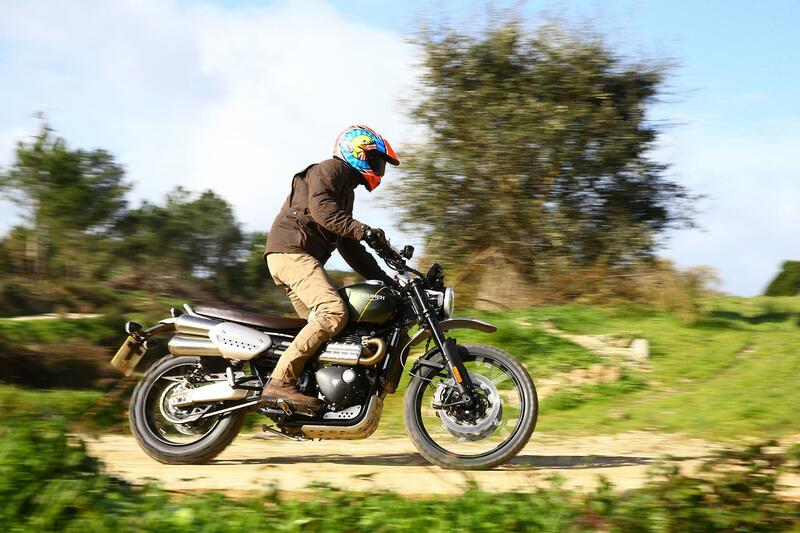 It may be the most unlikely of an on and off-road performance bikes (and it’ll wheelie for England), but both Scramblers are comfortable and refined for lazy days. 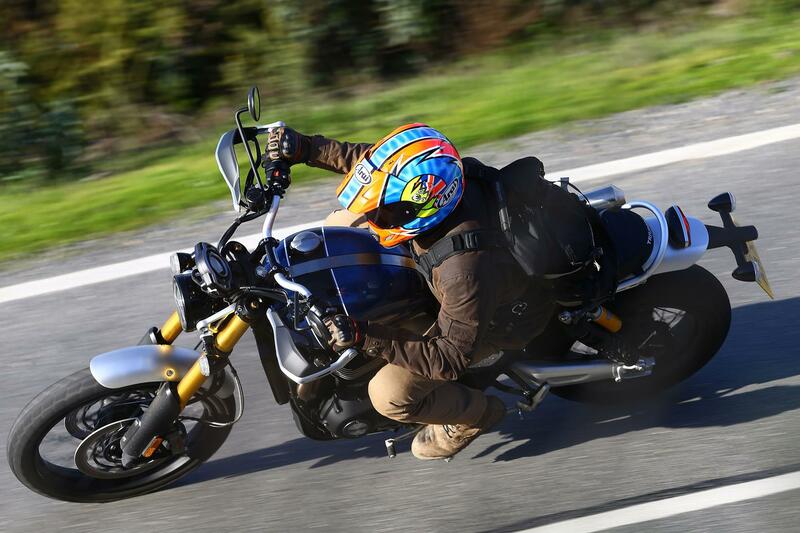 The throttle is smooth, the gearbox slick, the ribbed bench seat is all-day comfy. 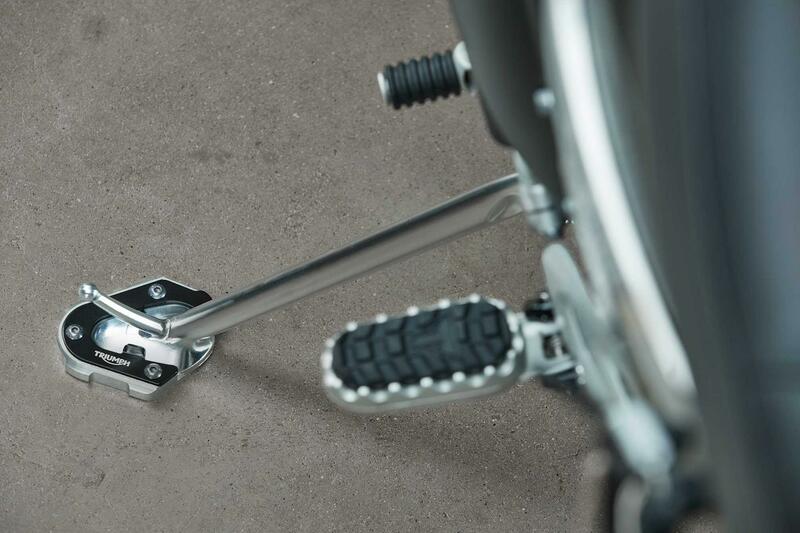 The XE is 30mm taller than the XC, but it’s not a problem getting feet flat on the floor. 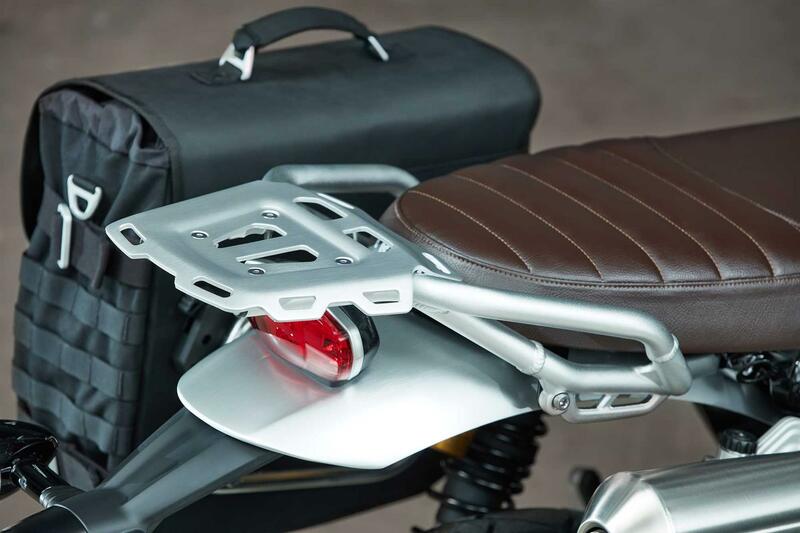 A spacious bar and peg layout won’t punish knees or wrists, but a lack of wind protection pummels your neck and head. 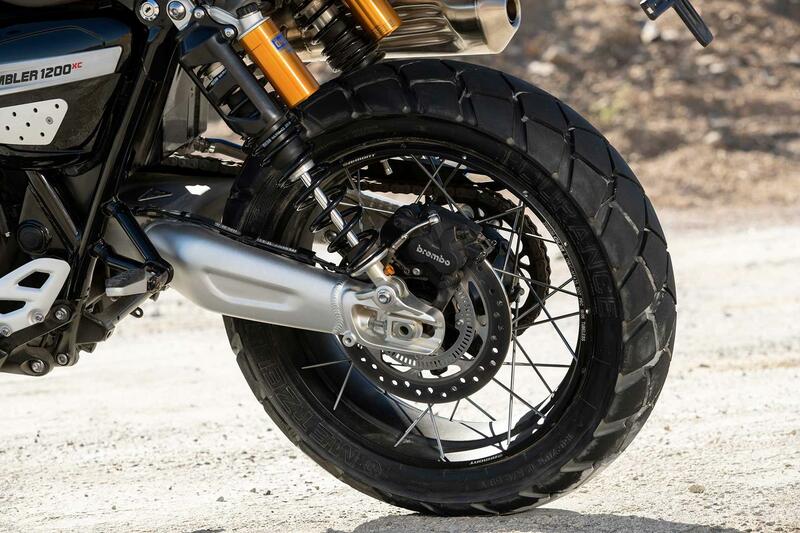 Despite sharing the same frame, suspension and wheels (including an off-road style 21” front) the two variants will feel different due to an increased rake angle on the XE. 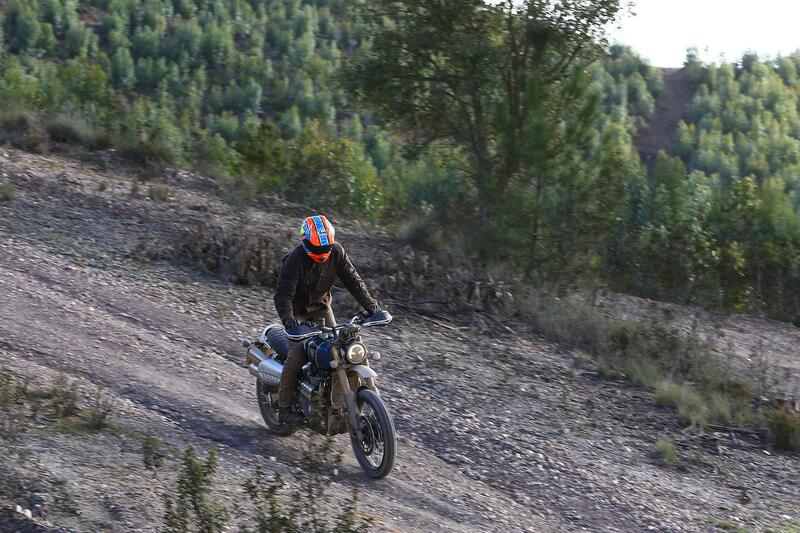 Even if you never intend to go off-road, this will give the model a distinctly more relaxed feel on the road. 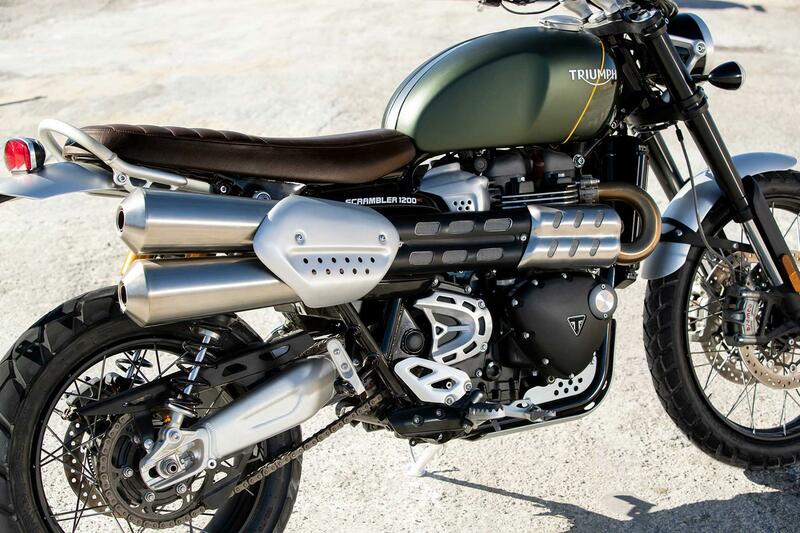 Cradled in its unique-to-the-Scrambler tubular steel cradle chassis, the Triumph’s high power Bonneville motor is pinched from the Thruxton and tweaked for more low down power. 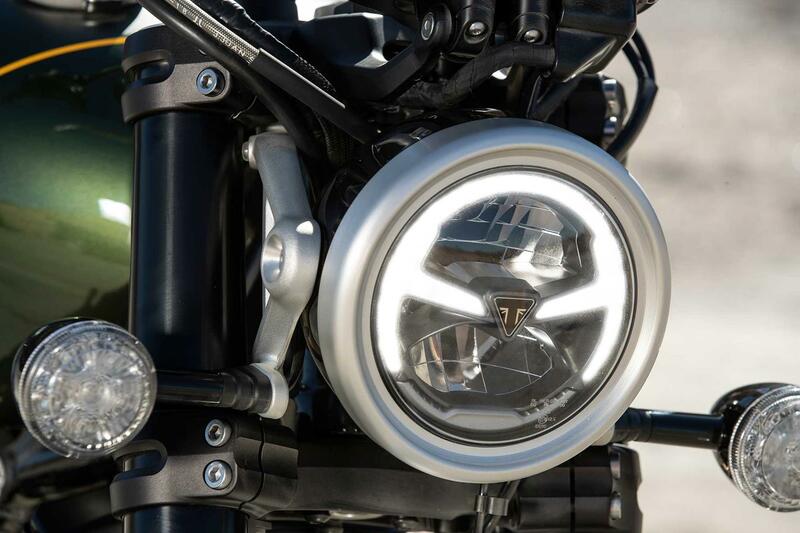 With its magnesium cam cover, revised clutch assembly, a low inertia crank, lighter alternator, mass-optimised balance shafts and engine covers, the burbling parallel twin is lighter, more delicate and responsive. 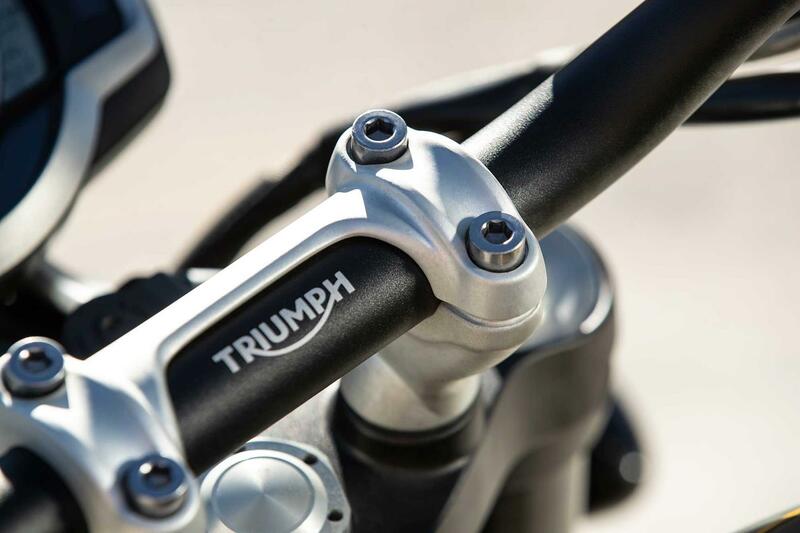 That first touch of the throttle needs to be smooth off-road and the Triumph delivers, like gently pouring cream into coffee, so it’s easy to feel for grip, play with the rear… and roost your mates. 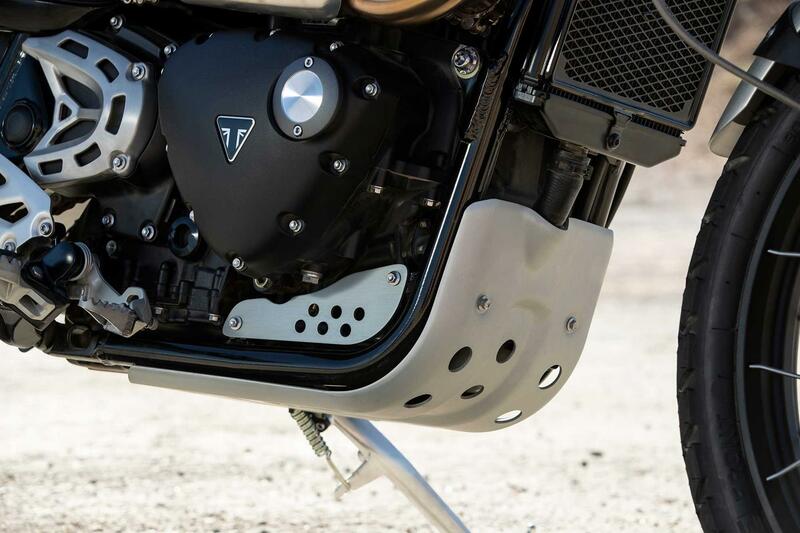 A 1.2-litre engined, 204kg (dry) machine may sound like a brute away from the tarmac, but the torque-assist clutch is light and the ride-by-wire throttle response is so polished, it’s as easy to manage as a smaller-capacity enduro. 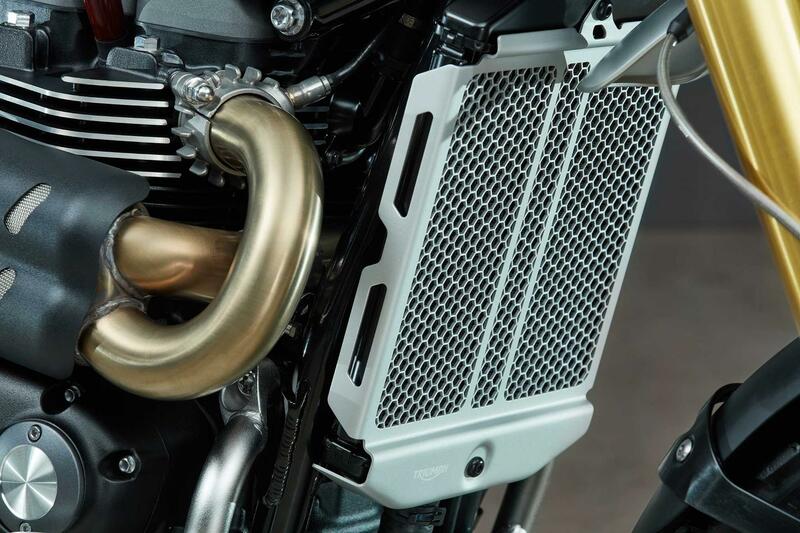 Those stainless steel pipes look as good as they sound, with brushed-finished silencers, ali number boards and the cat is cleverly hidden from view, but they can roast your inner thighs and calves at low speed. 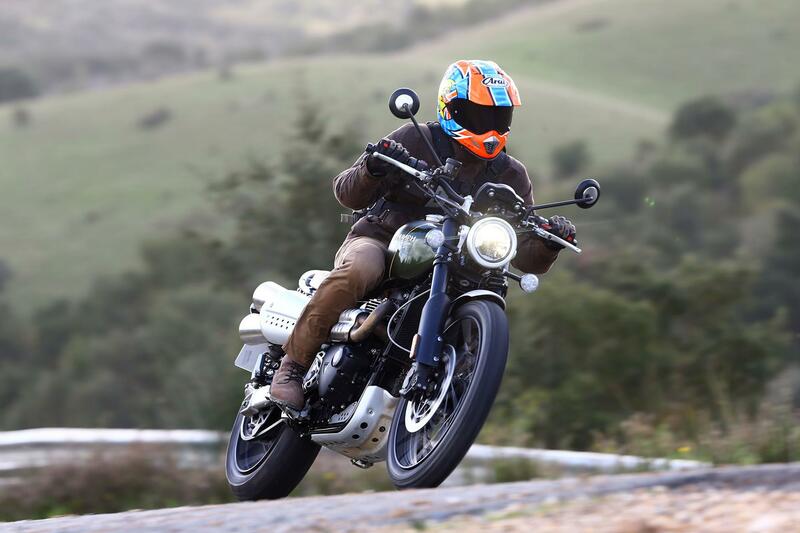 MCN owner reviews are nothing but glowing for Triumph Bonneville-engined machines, so don’t expect any major problems from the new Scrambler 1200. Service intervals are generous with the first major one at 10,000-miles and valve check at 20,000-miles. 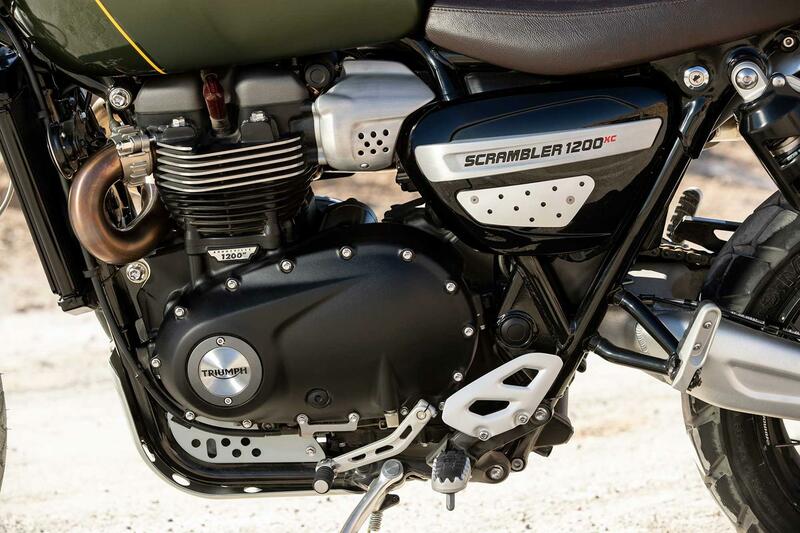 Loaded with beautiful design touches and rivalling a top of the range adventure bike in terms of equipment and technology, the Scrambler 1200 is remarkable value for money. 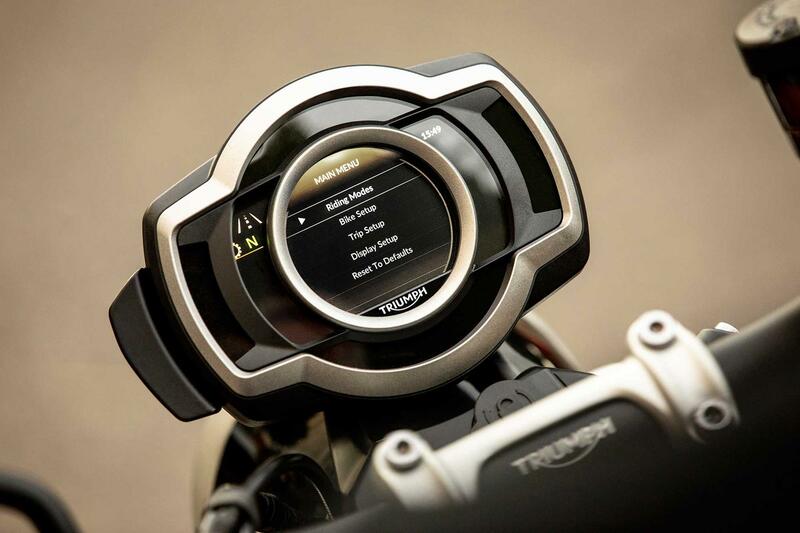 The base XC model starts at £11,500, while the more extreme XE rises to £12,300. 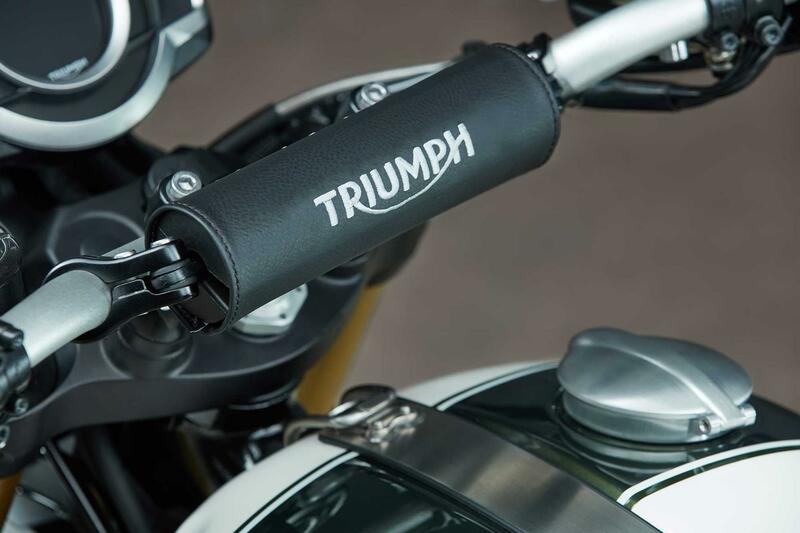 Each Triumph Scrambler 1200 model is available in two colour variants; Jet Black and Matt Black or Khaki Green and Brooklands Green for the XC, Fusion White and Brooklands Green or Cobalt Blue and Jet Black for the XE and both will have a list of over 80 accessories to customise them with. 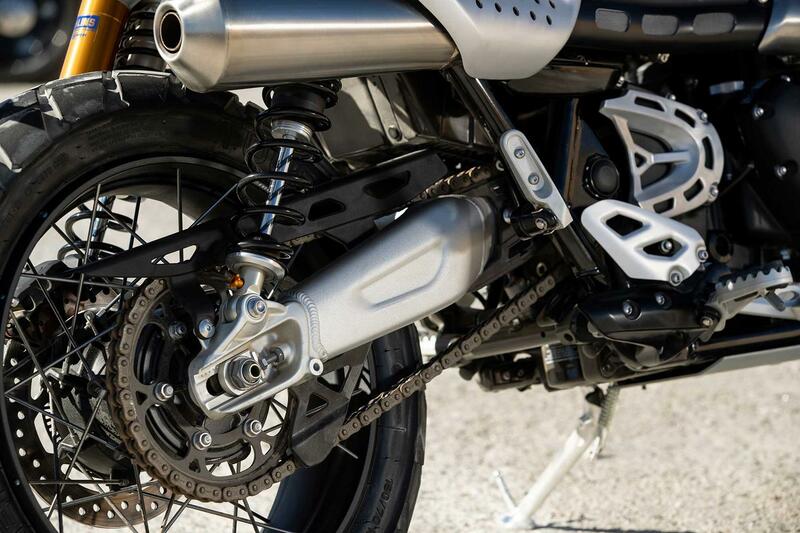 The base XC model comes with superbike spec Brembo M50 monoblocs, fully adjustable twin Öhlins rear shocks and Showa forks. 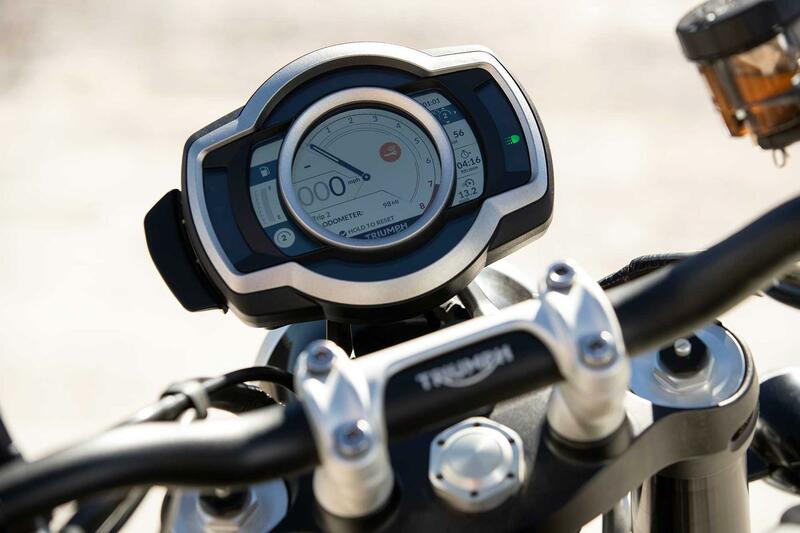 Side-laced wheels (21 inch front) are shod with Metzeler Tourance dual-purpose rubber and you also get riding modes, LED lights, illuminated switchgear, keyless ignition, cruise control and a USB charger. 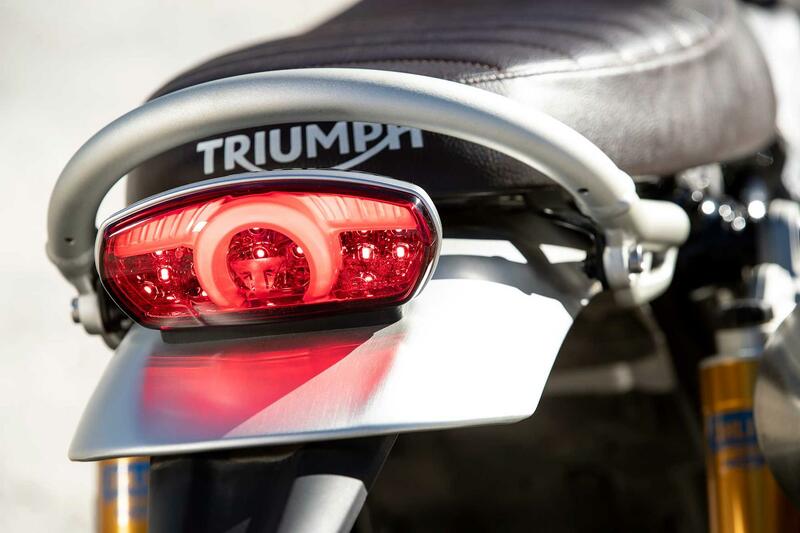 Triumph’s second-generation light-sensitive colour dash is a work of art. Featuring two 'themes' to choose from, the display is packed with information and the detailing on the 'Quartz' display has the classy look of a Swiss watch. 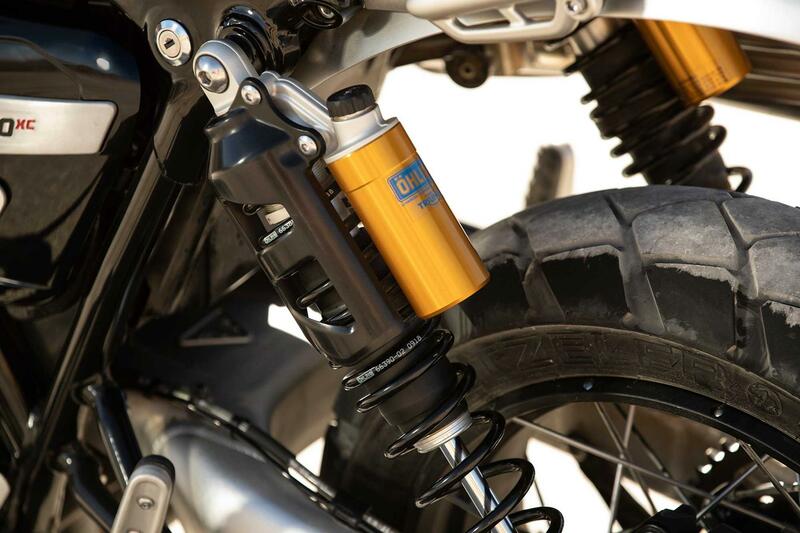 To give the Scrambler that '60s look, Triumph worked with Öhlins to create these fully adjustable twin rear shocks. 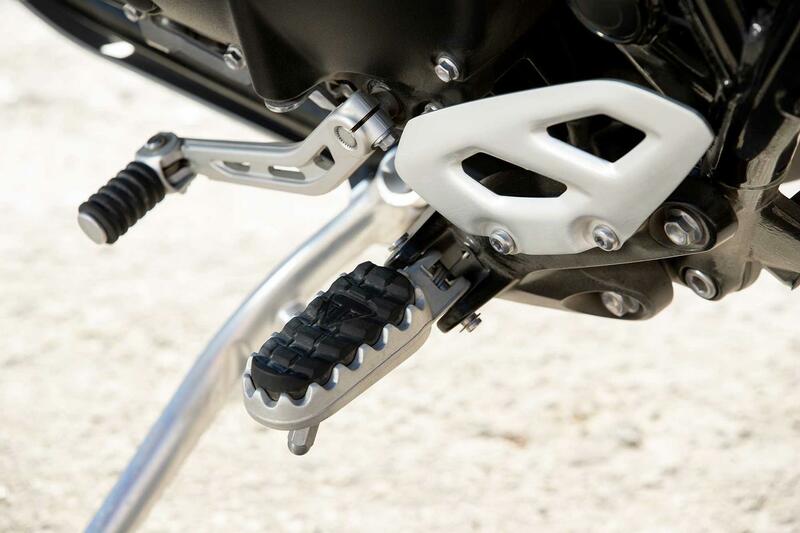 Designed to work as well as modern monoshock system, they deliver superb control and feel on and off-road. 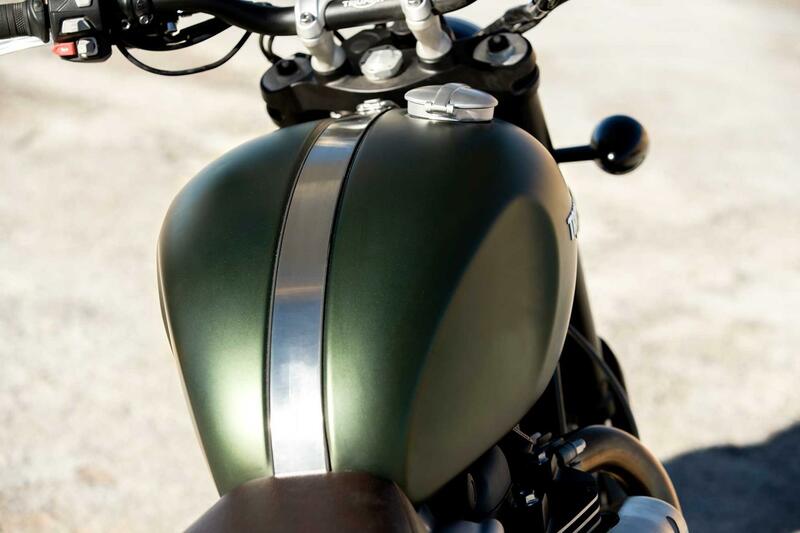 Design touches abound and the Scrambler’s seamless fuel tank alone is a work of art. Scalloped to take the forks at full lock, the stainless steel strap isn’t laid over the top, but sits in its own recess. 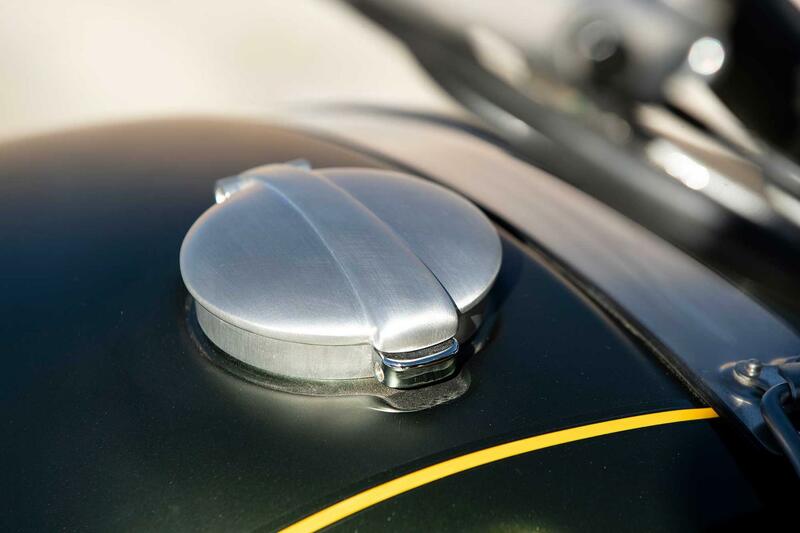 A Monza-style filler cap completes the look. 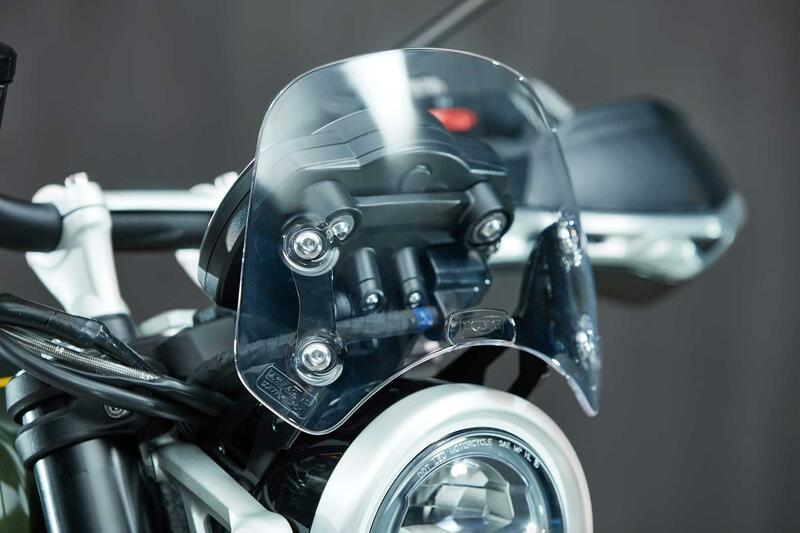 There’s even more bang for your buck with the XE version, which comes with gyro-controlled ABS and traction control, an extra riding mode (Off-Road Pro - bringing the total to six), a Brembo dual-ratio brake lever and 65mm wider (reversible and adjustable) bars. 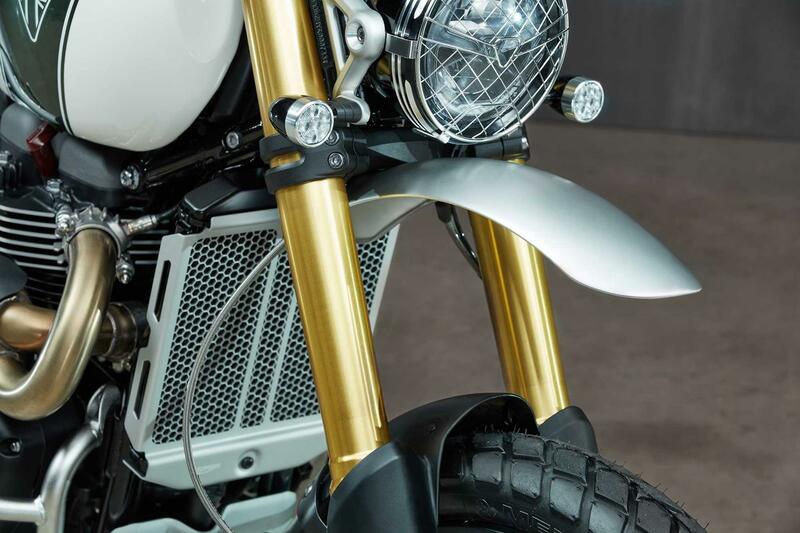 Front and rear wheel travel is increased 50mm to 250mm (that’s 30mm longer than a KTM 1290 Super Adventure R’s), fork diameter is up 2mm to 47mm and the anodised aluminium swingarm is 32mm longer. 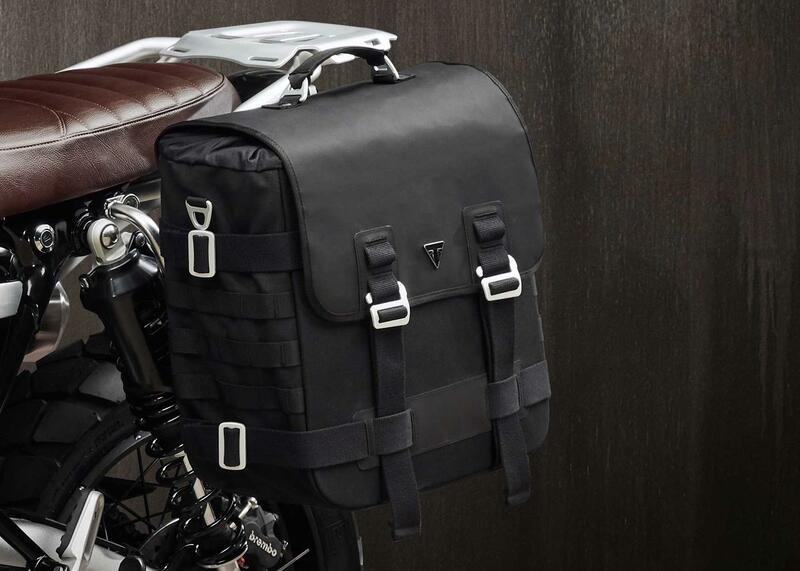 There are over 80 style, comfort, luggage and security accessories available and two Inspiration Kits: a touring-based Escape and a stripped down Extreme. 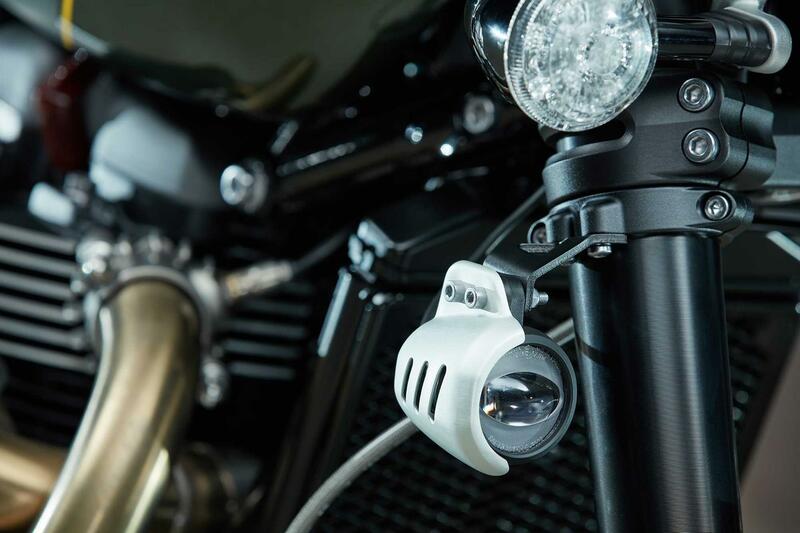 You can even opt to operate your GoPro from the switchgear, or link to Google Maps via the dash. 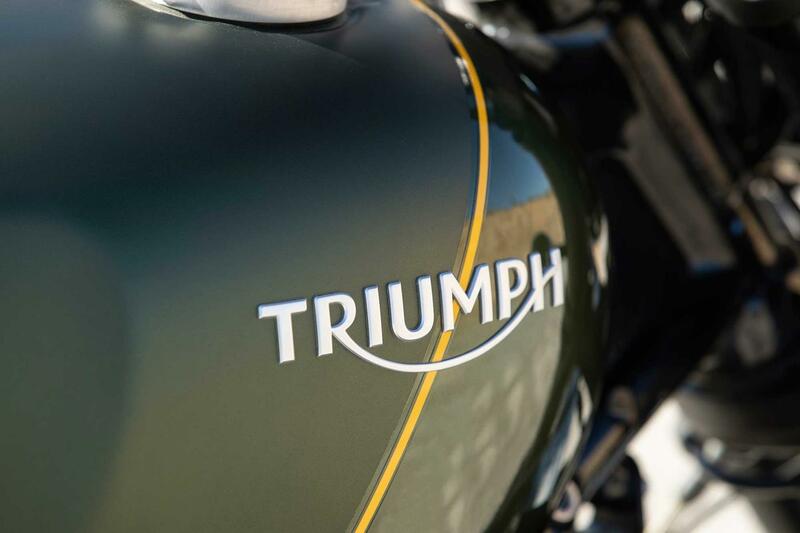 Triumph unveiled the much-anticipated Triumph Scrambler 1200 model during a launch event at the ExCeL London. 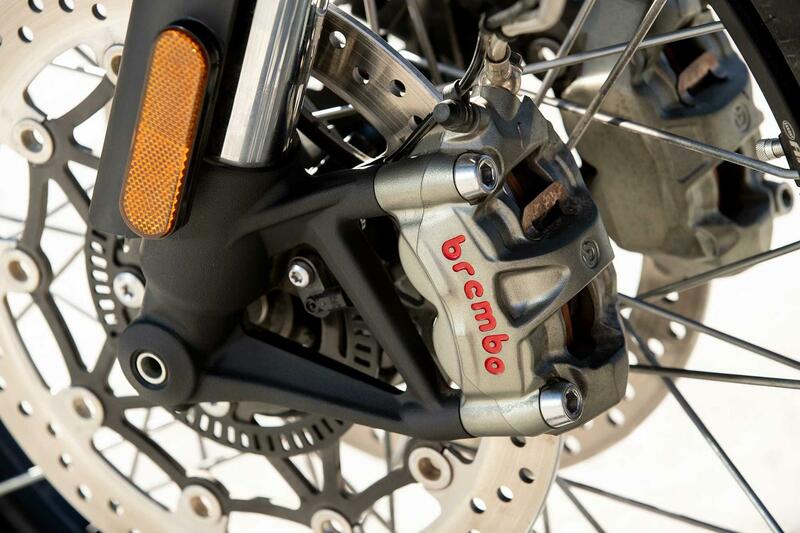 Front brake Twin 320mm discs, Brembo M50 monoblock calipers, radial master cylinder. Switchable ABS. 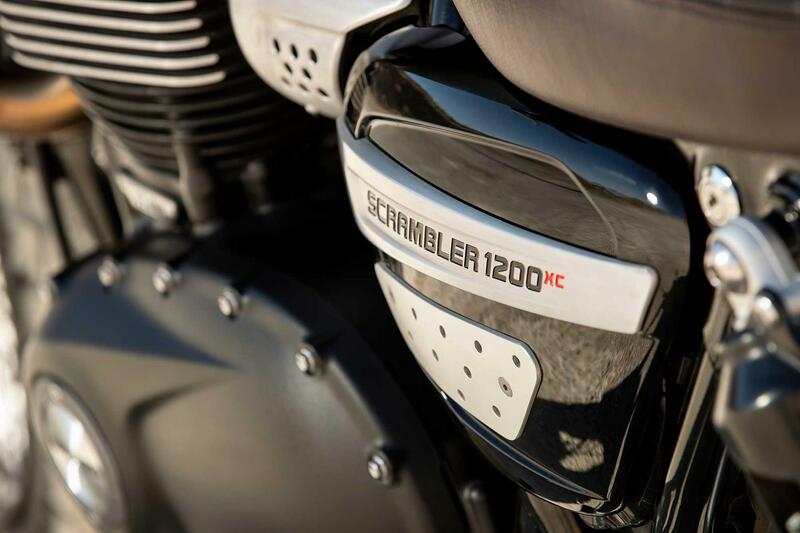 2019: Scrambler 1200 launched. 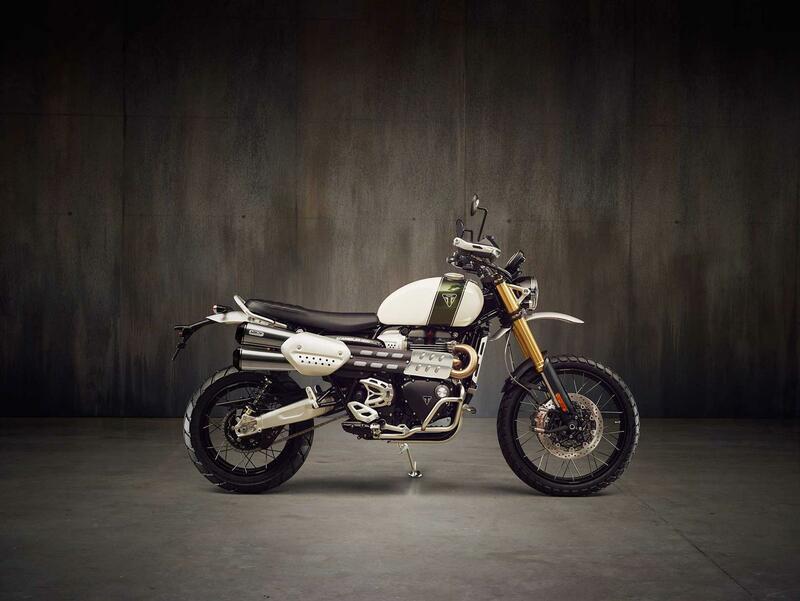 Dedicated chassis, tweaked Thruxton motor, full electronic rider aids, Brembos, Öhlins and true adventure bike-like off-road potential. 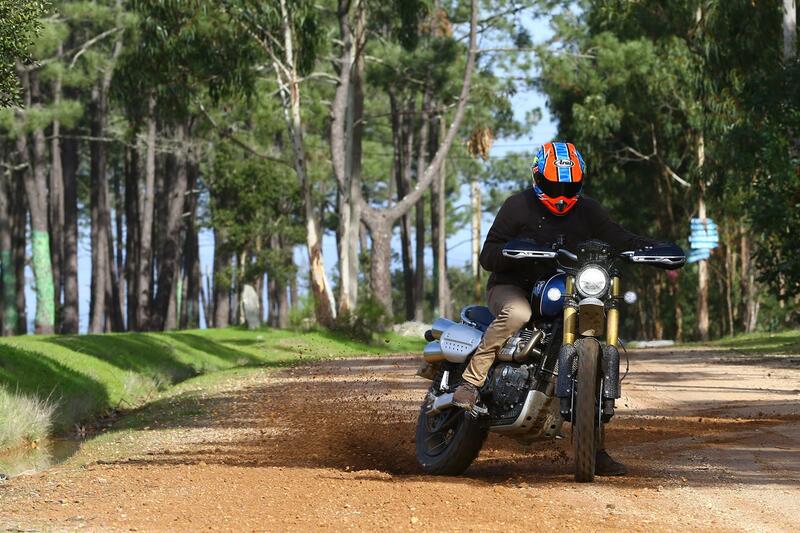 Scrambler 1200 XC: More road-focussed base model, but still lavishly equipped. 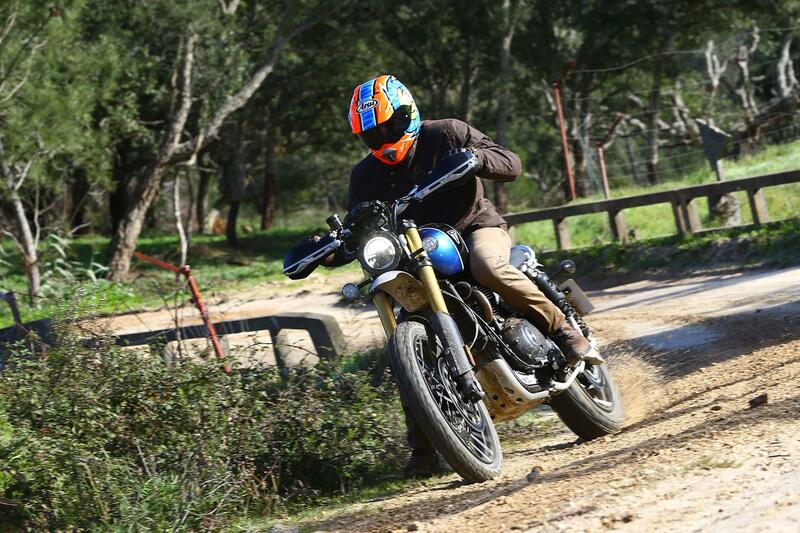 Scrambler 1200 XE: Longer travel suspension, fatter forks, longer swingarm, wider bars and lean-sensitive ABS and traction control. 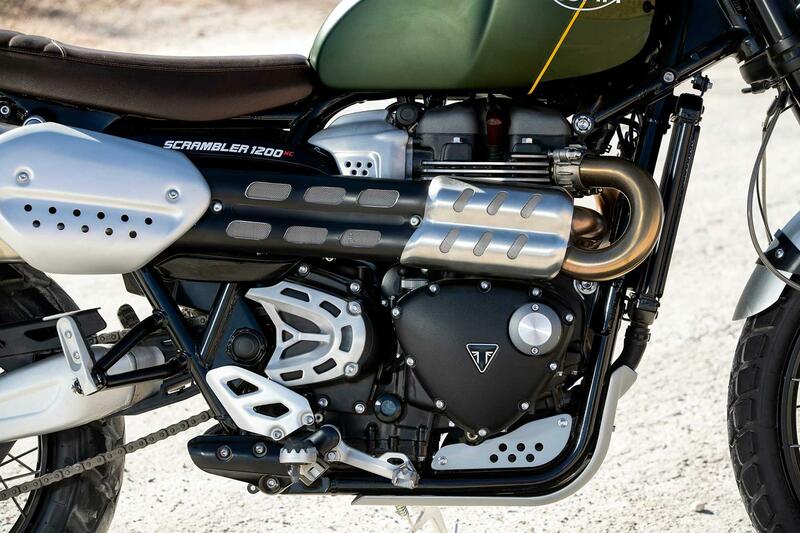 Designed for serious scrambling. 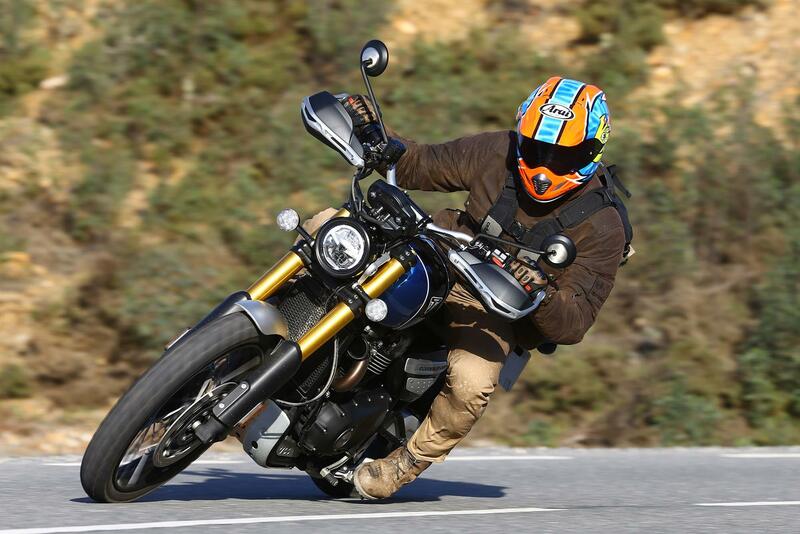 No owners have yet reviewed the TRIUMPH SCRAMBLER 1200 (2019-on).